Peanut oil, also known as groundnut oil or arachide/arachis oil, is a mild-tasting vegetable oil derived from peanuts. The oil is available with a strong peanut flavor and aroma, analogous to sesame oil. It is often used in American, Chinese, South Asian and Southeast Asian cuisine, both for general cooking, and in the case of roasted oil, for added flavor. Unrefined peanut oil has a smoke point of 320 °F/160 °C and is used as a flavorant for dishes akin to sesame oil. The refined peanut oil has a smoke point of 450 °F/232 °C is commonly used for frying volume batches foods like french fries. Its major component fatty acids are oleic acid (46.8% as olein), linoleic acid (33.4% as linolein), and palmitic acid (10.0% as palmitin). The oil also contains some stearic acid, arachidic acid, behenic acid, lignoceric acid and other fatty acids. According to the USDA data upon which the following table is based, 100 g of peanut oil contains 17.7 g of saturated fat, 48.3 g of monounsaturated fat, and 33.4 g of polyunsaturated fat. Highly refined peanut oil can contain traces of hexane, a petroleum byproduct used to maximize separation of oil from the solids of peanuts. The EPA identifies hexane as a neurotoxin in rat studies. There are no specific regulations on the limits of hexane use in cooking oils. If quality control is neglected, peanuts that contain the mold that produces highly toxic aflatoxin can end up contaminating the oil derived from them. Those allergic to peanuts can consume highly refined peanut oil, but should avoid first-press, organic oil. Most highly refined peanut oils remove the peanut allergens and have been shown to be safe for "the vast majority of peanut-allergic individuals". However, cold-pressed peanut oils may not remove the allergens and thus could be highly dangerous to people with peanut allergy. Since the degree of processing for any particular product is often unclear, "avoidance is prudent." Due to war shortages of other oils, use of readily-available peanut oil increased in the United States during World War II. "Peanut oil will make medicine"
Peanut oil, as with other vegetable oils, can be used to make soap by the process of saponification. The oil is safe for use as a massage oil. Peanut researcher George Washington Carver marketed a peanut massage oil. At the 1900 Paris Exhibition, the Otto Company, at the request of the French Government, demonstrated that peanut oil could be used as a source of fuel for the diesel engine; this was one of the earliest demonstrations of biodiesel technology. ^ Liu, Xiaojun; Jin, Qingzhe; Liu, Yuanfa; Huang, Jianhua; Wang, Xingguo; Mao, Wenyue; Wang, Shanshan (2011). "Changes in Volatile Compounds of Peanut Oil during the Roasting Process for Production of Aromatic Roasted Peanut Oil". Journal of Food Science. 76 (3): C404–12. doi:10.1111/j.1750-3841.2011.02073.x. PMID 21535807. ^ "USA-Grown Peanut Sources - Peanut Oil". National Peanut Board. Archived from the original on 11 June 2008. Retrieved 15 January 2012. ^ a b "USDA National Nutrient Database for Standard Reference". Nutrient Data Laboratory, Agricultural Research Service, United States Department of Agriculture. Retrieved 3 August 2011. Choose peanut oil and then "Oil, peanut, salad or cooking". ^ Anyasor, G.N. ; Ogunwenmo, K.O. ; Oyelana, O.A. ; Ajayi, D.; Dangana, J. (2009). "Chemical Analyses of Groundnut (Arachis hypogaea) Oil". Pakistan Journal of Nutrition. 8 (3): 269–272. doi:10.3923/pjn.2009.269.272. ^ "Aflatoxin suspected in cooking oil". United Press International. 29 December 2011. ^ Crevel, R.W.R; Kerkhoff, M.A.T; Koning, M.M.G (2000). "Allergenicity of refined vegetable oils". Food and Chemical Toxicology. 38 (4): 385–93. doi:10.1016/S0278-6915(99)00158-1. PMID 10722892. ^ Hourihane, J. O'B; Bedwani, S. J; Dean, T. P; Warner, J. O (1997). "Randomised, double blind, crossover challenge study of allergenicity of peanut oils in subjects allergic to peanuts". BMJ. 314 (7087): 1084–8. doi:10.1136/bmj.314.7087.1084. PMC 2126478. PMID 9133891. ^ "Peanut Allergy". Food Allergy Initiative. Archived from the original on 5 June 2011. Retrieved 3 August 2011. ^ Carlson, Margaret (13 January 2012). "Deaths Show Schools Need Power of the EpiPen: Margaret Carlson". Bloomberg. ^ "Peanut Biodiesel". Boiled Peanut World. 2010. Retrieved 3 August 2011. 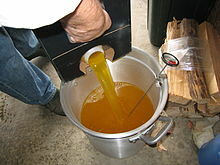 Wikimedia Commons has media related to Peanut oil.